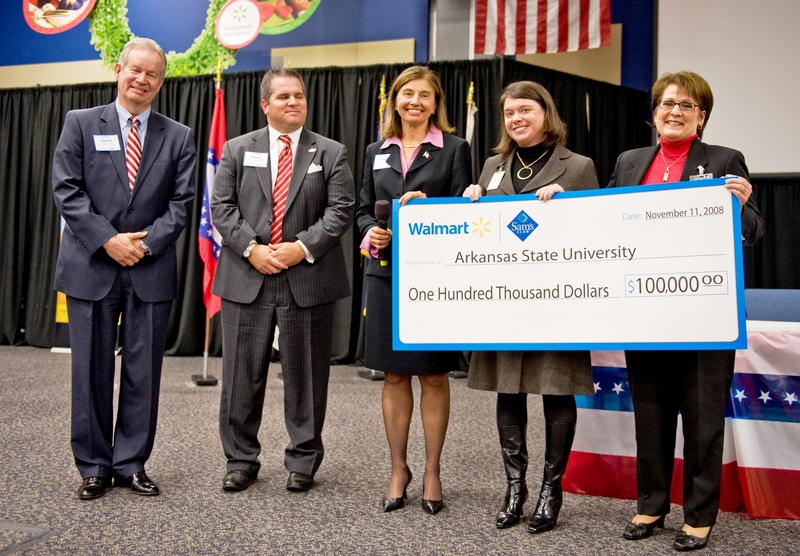 Nov. 11, 2008 -- Arkansas State University’s Beck PRIDE Center for America’s wounded veterans received a $100,000 grant from the Wal-Mart Foundation Tuesday morning to aid in building programs and developing resources to support veterans with access to higher education and help in completing their degrees. 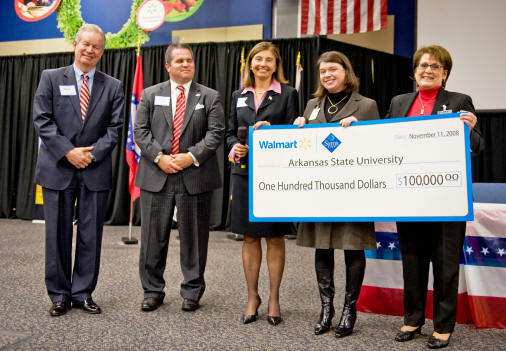 The grant was presented to ASU officials in Bentonville. The grant is part of a total $3.6 million package awarded by the Wal-Mart Foundation to 10 colleges and universities with $100,000 grants to each. The American Council on Education (ACE) also received a $2.5 million grant to support successful veteran educational assistance programs in 16 institutions of higher education. “Arkansas State University-Jonesboro is thrilled to have been awarded a $100,000 grant for its Beck PRIDE Center for injured veterans as one of 10 grants to higher education institutions in the United States that currently have successful veteran educational assistance programs,” said Dr. Robert Potts, chancellor at Arkansas State. (Calif.), Florida Community College, and San Diego Community College. It is estimated that the number of veterans in the United States will rise to more than 375,000 in 2009. "At the Beck PRIDE Center for America's Wounded Veterans, we have the privilege of seeing how the kind deeds of organizations like the Wal-Mart Foundation can change lives for military service members with combat injuries. We pledge to do our best to use these resources towards our mission,” said Susan Tonymon, program director of the Beck PRIDE Center. “Our mission is: ‘To provide combat wounded veterans with first class educational programs and services at Arkansas State University. These include, but are not limited to: resources to access to the higher education experience, resources for counseling, personal rehabilitation, advocacy, and financial assistance. Our efforts are directed at helping these individuals to achieve their post-military service goals.’"